Huge dirt ramps and a street skating course transformed the Civic Center Plaza into an adrenaline junkies playground. The Dew Tour Toyota City Championships, a free festival featuring skating, BMX and FMX starts up today. Xpress will be bringing you daily coverage of all the action and results. After spending some time practicing on the street course the night before the competition, four-time X Games street skating gold medalist, Paul Rodriguez takes a break. “They got the pier 7 mani pad right there, so I’ve been skating that thing since I’ve got here. They created all the best spots in San Francisco,” said Beasley, who was signed by Jay-Z’s Roc Nation in May. Beasley looks up to his team member, Rodriguez who also found success in skateboarding at a young age. 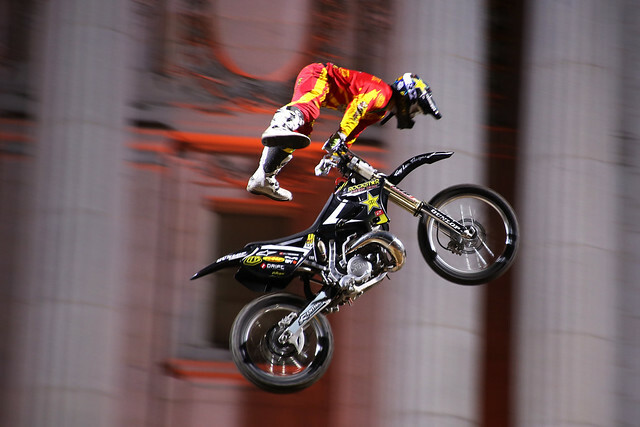 Other must-see features of the four-day tour are the Mongoose mini-jump course for kids in Civic Center and the downhill “Street Style” BMX challenge taking place Sunday at Rincon Hill on Harrison Street. These two courses will be opened to locals, according to Chris Prybylo, vice president of events and general manager of Dew Tour. The Dew Tour has a lot of exciting events coming up in the next three days, the skaters-only course at Civic Center will be opened to locals Oct. 18. Lil Wayne will be making an appearance as a commentator for the skate competition Saturday. You can watch the Skate Street event for free today at 1:30 p.m. in the Civic Center Plaza. Check out the full schedule of events here. Tearsa Joy Hammock contributed to this report. According to Prybylo, it is Dew Tour’s first year being hosted here.